Welcome to the Have Yourself a Cozy Little Christmas Giveaway Event, brought to you by Cheap Is The *New* Classy. 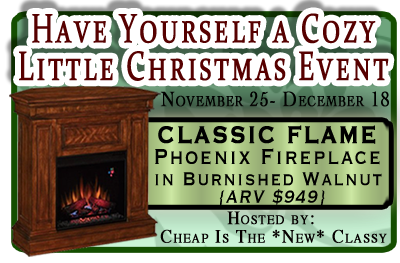 This event will end on December 18th and one very lucky person will win a phenomenal Classic Flame Phoenix Fireplace in Burnished Walnut to help keep you cozy this Christmas. This fireplace would look beautiful in any home. Just imagine opening Christmas gifts in front of your very own fireplace! I have fond memories of sitting in front of our fireplace as a child. It's such a cozy feeling being able to watch the flames lick the logs. Wonderful memories for sure. Be sure to come back daily for extra entries. Good luck! US only.